Kick off 1985 Week with one of my favorite teen comedies of all time! Looking back on the movies of 1985, it appears to be the exact point at which I really began to form as a film lover. It was the year of Commando, the first R-rated movie I ever saw and the one that made me a lifelong fan of action films. It was the year of Jewel of the Nile, the first movie I can remember going to see with my family in a theater and thinking "Something about that was off. It was not good." It was the year of Back to the Future, still my favorite movie of all time. But it was also the year of Savage Steve Holland's Better Off Dead, a movie that didn't so much shape my sense of humor as much as crystallize the kind of things I found funny. The movie does things I had never seen another movie do at the point, and while I couldn't exactly articulate why at eight years old, I knew that it made me laugh in a way that excited me. It is a dragon I would continue to chase over the next 30 years. I can still remember the first scene I ever saw from the film. As a kid, I would wake up before anyone else in my family on Saturday mornings (we're talking 5 or 6 a.m.) so that I could watch whatever I wanted very quietly on TV. Usually, it was the free previews of whatever movies would be showing on pay-per-view (then called Viewer's Choice) that month. One particular Saturday morning, though, I tuned in to HBO and saw a skinny, dark haired teenage boy sitting down at the dinner table, a weird bowl of greenish gelatinous goop resting in a bowl in front of him. He talks to his parents for a minute or two when suddenly -- and, more importantly, without direct attention being called to it -- the goop slides itself out of the bowl and out of frame. Whatever he was eating just got up and walked away. This was the funniest thing I had ever seen. Better Off Dead is jam packed with aburdist visual jokes like that one. Modern comedies are entirely dependent on the set piece, usually of the "gross out" variety. Compare something like the first American Pie with its five or six gag sequences to Better Off Dead, which has more visual jokes in its first 15 minutes that most contemporary comedies squeeze into their entire running times. It's not the gag-a-second, see-what-sticks kind of comedy made famous by Jim Abrahams and the Zucker brothers; the barrage of jokes in Better Off Dead are almost formalist in nature. They're goofy and often lowbrow to be sure, but every single one of them contributes to the film's very specific tone. It creates its own universe in a matter of minutes. How many '80s teen comedies were ever able to do that? Cusack plays Lane Meyer, a nice guy who's just been dumped by his high school girlfriend Beth (Amanda Wyss). Dejected and misunderstood by his distracted family (Dad's at war with the paperboy, little brother is building a rocket with parts sent away from the backs of cereal boxes, Mom is from another planet), Lane tries to find a way back into Beth's heart. The answer? Make the school's ski team captained by her new boyfriend Roy Stalin (Aaron Dozier in his only feature film appearance) and learn to ski the K-12, the town's most dangerous slope. Lane begins a series of half-hearted suicide attempts and wallows in his misery until he meets Monique (Diane Franklin), the French foreign exchange student living with the creepy neighbors. With Monique's encouragement, Lane takes steps to improve himself, challenges Stalin to a race down the K-12 and begins taking language lessons. You know...love. The language of love. 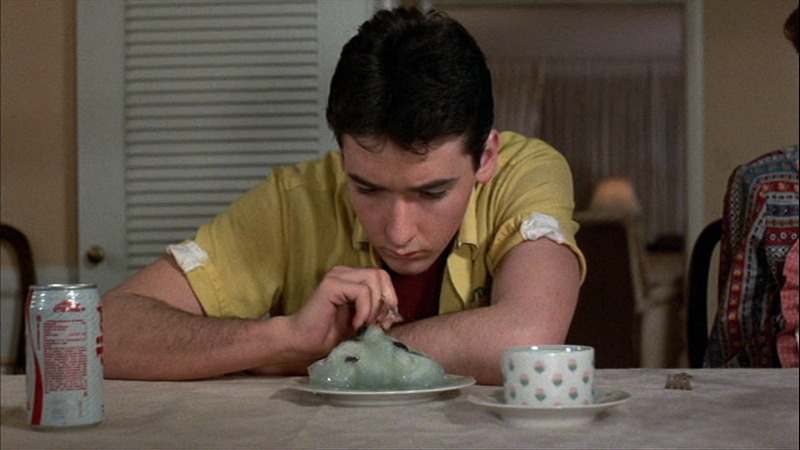 Better Off Dead is the teen film as done by David Lynch: idyllic suburbia peeled back to reveal bizarre characters and grotesqueries behind every neatly trimmed hedge and uniform garage door. It's there in weird neighbor kid Ricky (future Head of the Class star and Nickelodeon mogul Dan Schneider) with his ducktailed hair, his horn-rimmed glasses (long before they were cool) and his propensity for snorting nasal spray. It's there in his mom, a nightmare woman with a shock of gray hair, clown-red lipstick and a voice that makes men die inside. Like in much of Lynch's work, everything in the movie is something we recognize, twisted until it's a little darker, a little more strange. It's off. Lynch uses the trick to unsettle us; Better Off Dead writer/director Steve Holland uses it to make us laugh. I could make a running list of all the great gags in the movie, but where would I stop? The most famous one -- the one that people still remember -- is the psychotic paperboy chasing down the family and saying only "Two dollars!" But there's also the two Japanese students who learned English from Wide World of Sports and only speak in a Howard Cosell imitation, challenging Lane to a drag race every chance they get. There are the boxes of cereal that spill all over the kitchen every time someone takes one out of the cabinet, holes cut in the sides of each one so the box can be sent in for a prize giveaway. There's the hideous sight of dripping, slimy green "boiled" bacon. 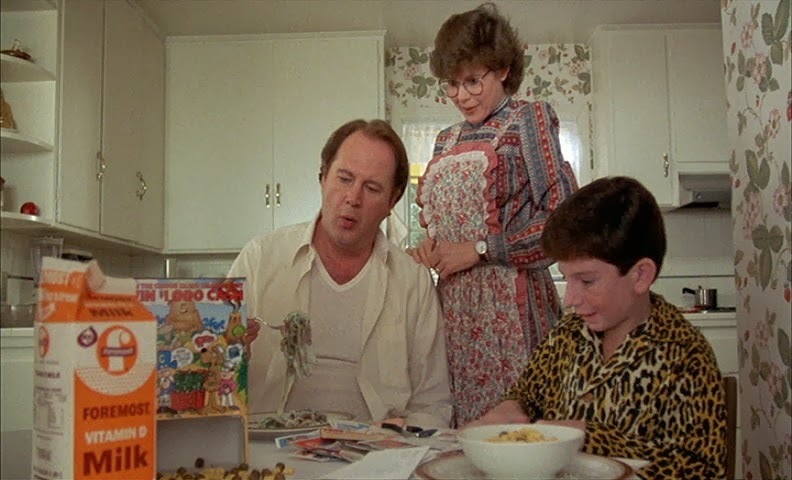 There's the sight of Lane's parents (David Ogden Stiers and Kim Darby, both brilliant in totally different ways) clad in animal fur on Christmas morning. There's the visual of Lane and Beth both furiously wiping their noses and cleaning their ears, both convinced they have something on their faces. There's the way everyone keeps dancing after Ricky face plants during his big moment at the dance -- a dance at which EG Daily (who played Dottie the same year in Pee-Wee's Big Adventure, part of F This Movie Fest III) is performing with her band. Best school dance ever! While the jokes are first and foremost the focus of the film, writer/director Holland has more on his mind than just making us laugh. Better Off Dead is a critique (and bizarre love letter) to suburbia, from the demented paperboys to the mailman who drops his letters all over the sidewalk to the freaky neighbors to zombified geometry class who hangs on teacher Vincent Schiavelli's every word to the mom who hands out frozen dinners at Christmas. But Holland also loves these characters, and that's part of what makes the movie so special. It is not mean spirited. This was the movie that first made me fall in love with John Cusack (he also starred in The Sure Thing in 1985, another of my favorite teen movies of all time, but I didn't see that one until a few years later), an actor who has grown far less selective in recent years but who was and is one of my favorite movie stars. I've written before that Cusack is the leading man with whom many of us identify, probably because we want to be him: sincerity, sense of humor, effortless cool (even when it's in a dorky sort of way) and he always gets the girl without having to sacrifice what makes him interesting and special. 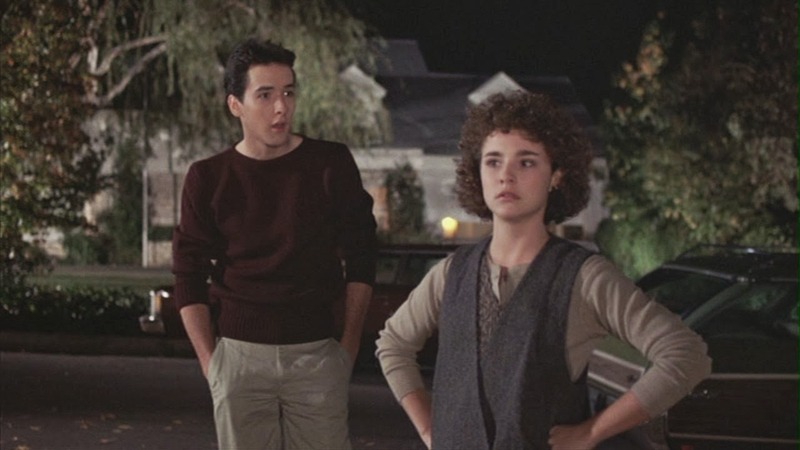 My affection for Cusack began with Better Off Dead not necessarily because I wanted to be be Lane Meyer, but because I understood that John Cusack the actor agreed to be a part of it. Looking back on it now, I can recognize that as a fairly sophisticated concept for an eight-year old to grasp -- that this movie is special, and by recognizing that and agreeing to be a part of it, this actor must be something special too -- but back then it was just something I understood and couldn't articulate. But Cusack is something special in Better Off Dead. He's sort of geeky, but in a charming, I-am-that-guy way. He's heartbroken without being pathetic. He's a romantic who just needs the right muse. Mostly, though, I love that Lane Meyer isn't dying to get out of his hometown. He doesn't hate his parents or feel like they're aliens, strange as they may be. John Hughes movies present every teenager as feeling totally misunderstood by his or her parents, anxious for independence, strangers in their own homes. Molly Ringwald established this template in Sixteen Candles, her every line reading dripping with contempt for her family. Lane Meyer knows his parents are strange. He knows his brother is unusual. He knows his neighbors are weird and his classmates are different. But he still loves his family and tries to be a good person. Isn't that how so many of us saw our own surroundings growing up? They may seem weird, but they're our family. Actually, with his vivid imagination and a resistance to conform to the town's eccentricities, Better Off Dead suggests that Lane Meyer is the biggest misfit of them all. He and best friend Charles De Mar (Curtis Armstrong playing one of the great teen movie sidekicks) don't fit in anywhere because they see the madness around them; the difference is that Charles has found a way to self-medicate by ingesting large amounts of drugs -- and when those aren't available, he'll snort the snow off a mountaintop. It isn't until Lane meets an even bigger outsider than him -- exchange student Monique -- that he's able to gather the courage to recognize that there is more to life than the town of Greendale. More to life than Beth. After The Last American Virgin, I should have hated Diane Franklin. Better Off Dead redeems her. I will always love Monique. Holland would direct two more features in the '80s, reteaming with Cusack one year later for One Crazy Summer and then directing How I Got Into College in 1989. Both have their charms -- I'd take either one over most of the teen movies released post-1985 -- but the edges felt sanded off. There are touches of Better Off Dead absurdity, but the movies feel like the studios didn't really want Holland to be Holland. Better Off Dead remains his magnum opus: brilliantly funny, surreal and inventive with a giant beating heart underneath. 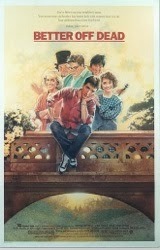 Better Off Dead is also a movie that brought me closer to my siblings. That same Saturday I first came across the movie, I told my sisters and my brother about what I had seen and insisted that they see it, too. This was back in the days when HBO would repeat their schedule twice a day; if something was on in the morning, it would also be on about eight hours later. 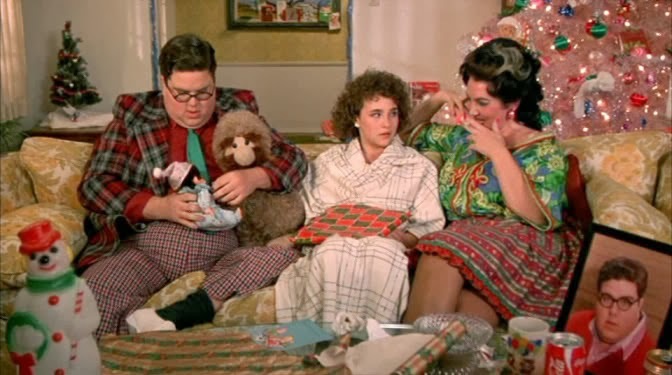 So I waited until around 4 p.m. when Better Off Dead repeated and the four of us watched it together. They saw the same genius I saw, and we all understood something about one another that day. The movie was funny to all of us, making us part of the same club to which very few others (especially in our 10-and-under age group) belonged. It became a staple of our childhood. We watched it constantly. We still quote things like "It's got raisins in it...you like raisins..." and "Christmaaaaaas" to one another. When I got married in 2004, Erika and I played EG Daily's "One Way Love" at our reception. Only Erika, my siblings and I were on the dance floor. I guess while a lot of people saw it on cable back in the '80s, it never became part of their lives. It has been and always will be a part of mine. 4 more days until F This Movie Fest! This is a wonderful movie. I first heard about it in 1986 when I read its 3 star review out of the Video Movie Guide (a small, but extremely thick book published every year). I then rented it from my local video store and fell in love with it instantly--for many of the same reasons you state above. Funnily enough, whenever it was a minimum day, my woodshop/science teacher in middle school would show this to our class. All the kids loved it, but looking back, it's amazing how subversive this movie really is to show to a bunch of 6th/7th graders at school. One thing in recent years that has bugged me is that Steve Holland has stated that while filming One Crazy Summer, John Cusack went to the theaters to see Better Off Dead on the opening weekend. He came back and told Holland it was the worst movie he's ever seen, that he was embarrassed to be a part of it, and if it had come out earlier, he never would have worked with Holland again. Needless to say he didn't after One Crazy Summer. No kid who saw this in the 80s ever wanted their two dollars back from the video store. I read about that Cusack story when I was doing a little research for the column and it bummed me out. I still think it's one of his best movies. Hopefully now he can see it for what it is and how much it stands out from the rest of the '80s teen movies. I'd hate to think that in the era of The Paperboy and The Raven that he still looks down on this one. I agree. He acted in (almost) every scene. Not sure what movie Cusack thought he was making, but his performance worked. Sometimes I think he's better here than in Say Anything. And Amanda Wyss coming off A Nightmare on Elm Street never looked better in a film. At one time or another, most males have felt like doing something as stupid as skiing the K12 to impress an ex, but it takes something special to notice the Moniques that are always right under your nose. "Everybody wants some! I want some too!" Same thing happened to me in '87; I was 12. Saw it on HBO and it was immediately one of the greatest things that had ever existed. The crawling food was ALSO the gag that I couldn't believe I was watching. Rewatching it recently, I realized it had a great deal of truth at the heart of it -- how losing a first love (especially when that love has become EVERYTHING to you) can be so overwhelming. And how every song you hear is about your pain. And how everybody you know...or even people you don't really know exist...want to date your ex, and feel the need to ASK you about it, instead of just stabbing you to death, which would be too merciful. It's beyond over the top but it's rooted in real emotion. It understands pain. Which sounds stupid in a sense because it really is one of the most cheerfully absurd movies ever made and so much fun...but the movie KNOWS that hurt. It just wants to touch on it while also providing lines like "I'm sorry your mom blew up, Ricky." Still a classic. Great piece, man! Thanks, Albert. I was surprised when I rewatched it for the column that it doesn't work just because of my nostalgia; the movie is still funny and still does have honest emotion behind it. I wasn't surprised to find out that it was a very personal movie for Steve Holland, who put a ton of his own experiences into the script. Thank you Mr. Bromley. I was 10 when this came out & my mom took me to see it on Halloween night. It's held a place in my heart ever since and the soundtrack cd is still in heavy rotation in my house. This was one of my older sister's favorite movie growing up. I was a 90's child but she was older and all Madonna and Cyndi Lauper. She was the type to watch her favorites over and over, I think in college she saw While You Were Sleeping about 12 times in the theater probably with a different date each time. Anyway we endlessly quoted this film. Just watched it with my husband (who had never seen it) and we were both laughing out loud throughout. It's a gem.